Wow! What a busy three days! Since Sunday, I've literally walked more than 30 miles up and down the aisles of the AHR Expo and Las Vegas (it almost doesn't make me feel so bad for not having gotten in any running). Now that the Expo has wrapped up, exhibitors have all but disassembled their booths and contractors are headed back to reality full of ideas and contacts, I'm going to take a minute to thank Lesta Isely. If you happened to stop by our booth at the show, whether to get your picture taken for or simply to pick up a January copy of the magazine (or even to say hello), then you were lucky enough to encounter Lesta. 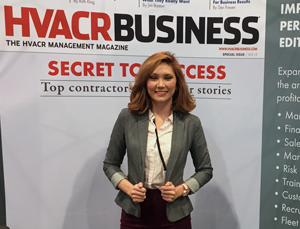 While I spent the better part of the last few days running around like a mad man (as did the rest of the HVACR Business team) Lesta handled one of the more difficult jobs — standing all day at the booth. And she did it with a smile and a friendly demeanor all day, every day. A lot goes in to attending a trade show, especially when you have a booth but are expected to go out and meet with others. You can't always be at the booth, and finding someone who is friendly and a good brand ambassador is key. Thank you, Lesta, for representing our brand to the industry these past few days. It's been a whirlwind of a week, the crowded show floor is now a thing of the past and it's time to say goodbye to Las Vegas. For those of you who came out here to the desert, have a safe trip back home. I'll be back next week to post my final thoughts on AHR Expo.